1. To begin, find a colour photograph or picture of a duckling (try looking in an animal or farmyard book). You'll need to get this colour photocopied as many times as you want to use the image, to a suitable size. You can try variations in the pattern, such as one large image or a single row or panel of smaller images. 3. Place the second piece of PVC over the top and use a sewing maching to sew the two pieces together around all four edges, again leaving a border at the top for the eyelets. This will prevent the images from getting wet. 4. Fix the eyelets along the top of the curtain above the stitched line and add hooks to attach to a shower curtain rail. 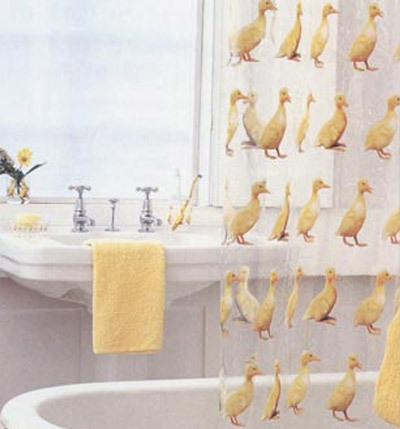 You will need: coloured picture of a duckling, scissors, 2 pieces of PVC, each yje size of a shower curtain, clear-drying glue or double-sided sticky tape, sewing machine, eyelet kit, shower curtain hooks.